I’ve been on assignment in Washington DC the last few weeks, and happily my time coincided with Fotoweek DC. 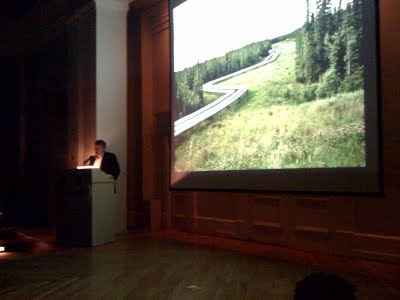 Earlier this evening I attended a talk by Edward Burtynsky at the Corcoran Gallery talking about his new show “Oil”. It is one of the most powerful collection of photographs I have seen, and his talk gave an interesting account of how his ideas have progressed over the years and some of the challenges he has overcome to document the places he shows us. He started out covering railways in the 1980s, and since then has pointed his view camera at quarries, the mining industry, and the explosion of manufacturing in China. Over the last 10 years he has turned his eye to oil, and through it the impact we have had on the land. The show begins with a series of photographs of the hell-on-earth landscapes of the Canadian tar sands, to show us where oil comes from. Next, a series of aerials shows us the lifestyle oil has allowed – the endless suburbs of Las Vegas and the enormous motorways of LA. Finally, he shows us what happens when we are finished with it all. From the deserted oil fields of Baku, now one of the most polluted places on earth, to the ship breaking yards of Chittagong where bare-footed workers scrap oil tankers by hand, we get a glimmer of the future – of what the world will look like when we have run out of oil. In spite of the beauty of the photographs, it is not a pretty sight. You can see the curator of the show, Paul Roth, give a brief introduction here.